Cedar pollen, for those with allergies, causes burning eyes, runny nose, itchy ears and excessive sneezing. Cedar pollen allergies are typically much worse than ragweed. This is due to the biochemical structure of cedar pollen's protein coat, which appears to have properties that make it unusually noxious. The sheer quantity of the grains compounds these problems. 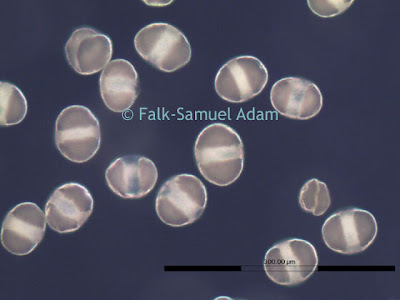 Image of cedar pollen captured with a biological microscope and the Jenoptik CT3 microscope camera. Pollen is a fine coarse powder containing the microgametophytes of seed plants. Pollen grains have a hard coat that protects the sperm cells during the process of their movement from the stamens to the pistil of flowering plants.